Since I had never been on the Kingfisher Trail at Pinnacle Mountain State Park, my sister and I scouted the trail before I led this hike. Even though she told friends afterwards that she had hiked miles and miles, I figured it was less than the quarter-mile given on a map. Eric Sundell had told me that he held the record for taking 2.5 hrs to walk the trail on a group hike years before, so I expected to finish the Kingfisher with enough time left to hike along the river to see shellbark hickory trees. However, our group took three hours to complete the Kingfisher Trail and it was noon instead of the suggested ending time of 11:30 a.m., so we did not visit the shellbark hickories. The morning of October 1 was beautiful, sunny but not too hot. Eight people showed up for the hike: Dewayne and Cindy Hancock, Ray and Linda Erickson, Maury and Barbara Baker, and Mike and Peggy Burns. 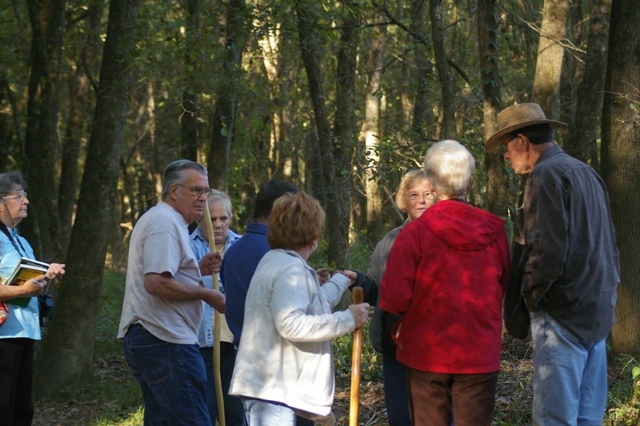 The trail begins at the parking lot and winds through a bottomland woods. The wildflowers were not in abundance, but they were scattered throughout. The most obvious along the trail was the yellow wingstem (Verbesina alternifolia). A few asters, Drummond’s aster (Symphyotrichum drummondii) and possibly calico aster (S. lateriflorum) were observed. (From a distance, we thought the purple was a perennial phlox; Ray, whose eyesight must be a little better, insisted it was not and went across the Little Maumelle riverbed to get a specimen. 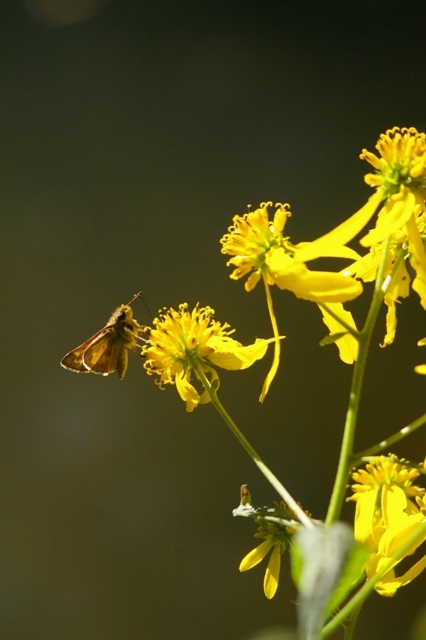 He also got a shot of a skipper on the flower.) Tall ironweed (Vernonia gigantea) was found in the streambed along with the largest population of cardinalflower (Lobelia cardinalis) that I have ever seen. 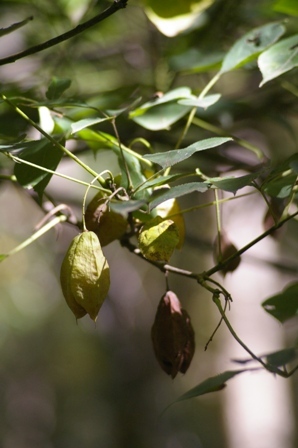 Chinese yam or air-potato (Dioscorea polystachya) was hanging off an understory tree and one small tuber was visible. Perhaps the dry weather influenced the size of the tuber because it would have been hard to feed our group on this small one. Continuing on the trail to where it parallels the Little Maumelle River, we saw some bald cypress (Taxodium distichum var. distichum) that probably were 50 feet and taller, on the bank. One tree we encountered was hollow and a person could actually fit into the cavity. 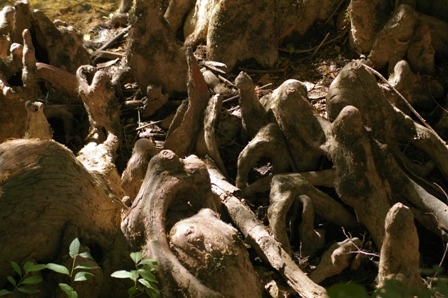 Numerous cypress knees gave the scene a surreal quality. These features have long confused botanists as to their function. 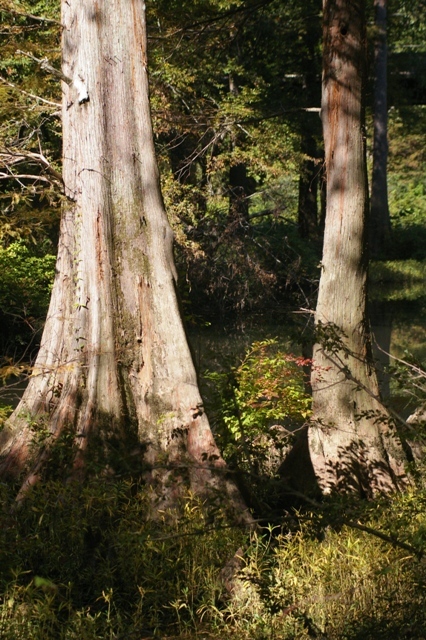 For a long time, it was thought that they were aerial roots, similar to those of mangroves, which provide oxygen to the bald cypress during times of inundation; however, that has been disputed in recent years. The knees are now thought to help stabilize the large trees that grow in muddy soil. Our group observed understory trees including American bladdernut (Staphylea trifolia), with many bladders, and hophornbean (Ostrya virginiana). Alabama supplejack or rattan vine (Berchemia scandens) was common in the area, its smooth twisted vines ominously wrapped around other trees. The hike was very interesting and the company pleasant and knowledgeable. It appeared that this trail, being very accessible and so close to Little Rock, gets lots of traffic. A map of the trail and the area is available here. We were all delighted to run into a group of Arkansas 4-H members picking up litter. There were about six in the group with one being four years old. They were delighted at finding trash to pick up and the trail was very clean. It was also heartening to see so many young couples taking their children to walk in nature on one brilliant fall morning. 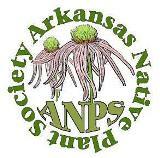 The Arkansas Native Plant Society organizes field trips throughout the year. Check the web site often for announcements of upcoming trips. Editor’s Note: Burnetta Hinterthuer is an instructor in botany at Northwest Arkansas Community College. 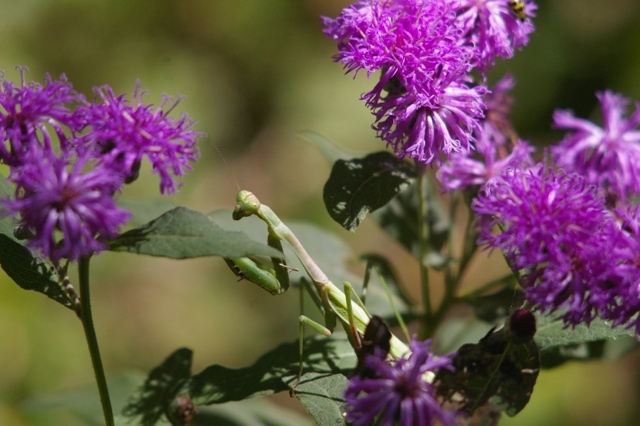 This entry was posted in Field Trips and tagged Arkansas Native Plant Society, Burnetta Hinterthuer, Kingfisher Trail, Pinnacle Mountain State Park. Bookmark the permalink.